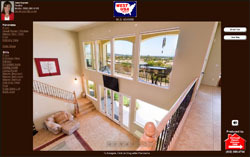 Your virtual tour is completely customizable at no extra charge. Feel free to choose any color, texture or image for your tour's background. We will include any logo's, pictures and text you provide. 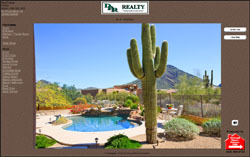 We can even match your virtual tour background with your website. Panoramic - Viewer can pan left and right. 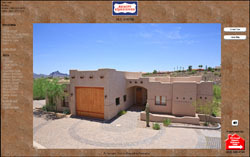 Good for viewing 3 sides of a room or Arizona landscapes. 360° x 360° - Full 360° field of view as well as up and down. Good for showing spacious rooms and yards. Slide Show / Still Images - Professional still images taken with wide angle lens to make the room feel as large as it really is. 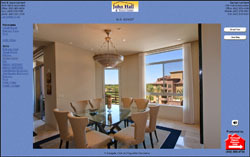 High Definition - View your virtual tour in full screen mode. 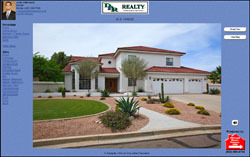 New Hi-Def virtual tours provide clear, crisp images. Loading is fast and navigation is very user friendly. 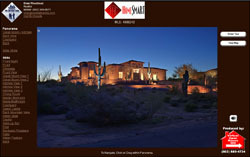 Evening Virtual Tour - Shooting your Virtual Tour in the evening hours provides the perfect lighting for great interior shots. 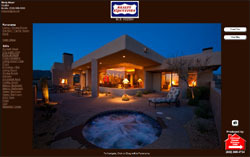 Also, evening Virtual Tours are great for showing off outdoor lighting and spectacular sunset views.